The San Joaquin County Sheriff’s office had a spot to fill in its canine unit, but not the immediate funds, so it was going to have to wait to complete its K-9 team. That’s when a generous donor stepped forward, offering thousands of dollars for the purchase of a dog. That dog, named Duke has arrived from Germany and has been bonding with his partner Deputy Mark Utterback. The 2-year-old German shepherd has already learned how to leap from the ground through a window into Utterback’s vehicle. “You live together, you work patrol every day, it’s just like having a partner in your car,” says Sgt. Paul Hoskins, a former canine officer. Also huge is the price tag of these canines. San Joaquin County Sheriff Steve Moore says these highly trained canines are a crucial part of the department’s entire operations. 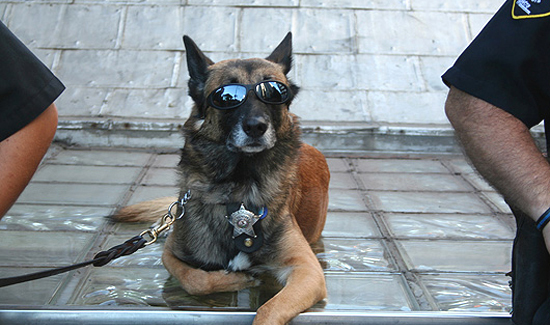 Down one K-9 team, the department was looking to complete its full team. Enter dog lover and generous donor Rogine Couch. She donated nearly $10,000 so the department could purchase Duke, and says it’s worth every penny. As the introductions were made, she was not disappointed.